Those unfamiliar with the concept of the False East/West Paradigm will probably be at a loss as to why the establishment would WANT to deliberately undermine America's geopolitical or economic position. Once they understand that both China and Russia maintain close ties to the globalist framework, and that they represent false opposition to the “new world order”, the reality of the situation becomes more clear. I recommend my article 'In The New “Multipolar World” The Globalists Still Control All The Players' for facts and evidence on this dynamic. The engineered destabilization of the US and parts of Europe and the rise of the East is intended to cause the removal of the current economic model of sovereign nations and currencies led by the US dollar as the world reserve. This would leave quite a void in the global economic structure, a void which the elites plan to fill with a new centralized one world currency system. In my article 'How A Collapse In Venezuela Could Trigger Martial Law In the US', published in May of 2016, I outlined how the socialist structure of Venezuela in particular was so unstable that the slightest push could cause the entire country to topple. Venezuela did indeed crash economically to the point that martial law is the only mainstay holding the system together. In recent months, however, the Trump Administration has added a new dimension to the problem. Expanding sanctions against Venezuela are adding fire to the flames of economic collapse. With an even more aggressive stance against Nicolas Madruro including possible military action, the prospect of a direct US led coup is now on the table. One would think that if the US government wanted a breakdown in Venezuela, all they would have to do is sit back and wait as the socialist nation imploded under it's own faulty economic policies. But apparently the country was not collapsing fast enough for the elites. My theory – the goal is to create another Syria, but this time much closer to US borders. Venezuela has close ties to not only Russia, but also China. Venezuela's military ties to Russia are well known. Their military is supplied to this day by Russia, and Russia has been very vocal in their opposition to any US military involvement in the region. Both China and Russia continue to support Nicolas Madruro as the president of Venezuela in the face of opposition from assembly leader Juan Guaido. The US and a number of European nations support Guaido. 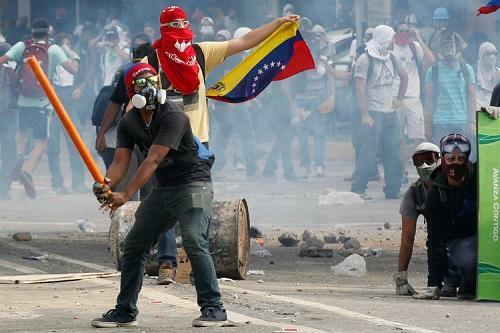 The question is, how far will a confrontation in Venezuela go? I find it interesting that extreme leftists like Ilhan Omar are suddenly interested in exposing the underhanded nature of such tactics. They remain decidedly quiet on the same kind of subversion in Syria, and aggressively push for a continued American presence there. My suspicion is that this might be an establishment attempt to gain conservative support for a US led coup in Venezuela. Whatever their leftist puppets attack, we are supposed to defend, right? If this dynamic happens again in Venezuela, I predict immediate and aggressive economic response from Russia and China, including yet another excuse for China to dump its US Treasury Bond holdings and dollar reserves, effectively killing the dollar's world reserve status. The US would be hit the hardest by this reset, and with the Trump Administration driven by globalist warmongers like John Bolton, there would be little sympathy from the rest of the world when the consequences land on our doorstep. It should not be considered a coincidence that the situation with Venezuela is being accelerated at the same time as tensions between the US , China and Russia are hitting a crescendo. Add yet another regional conflict similar to Syria on top of the trade war, and the potential for a financial "World War III" is high. If allowed to play out uninterrupted, such an event provides even more cover for the “global reset” and the shift to a one world economic model. Not only this, but a collapse epidemic in South America could lead to vast migrant caravans swarming to the southern US border far beyond what we have already seen. As Operation Garden Plot outlines, this would inevitably be used as a rationale for martial law measures.